The Kids' Whole Future Catalog, published in 1982, contains this illustration of future communication. 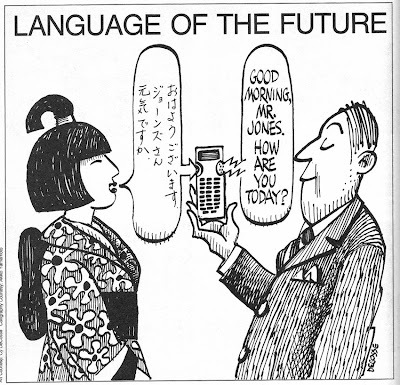 In the future, you won't have to learn a foreign language in order to talk to people from other countries. You'll just get out your electronic language translator. If you want to speak in Japanese, you'll just snap a tiny Japanese "memory capsule" into the machine. Then the machine will translate anything you say into that language. When you say "Hello" out will come "Konnichiwa" in perfect Japanese. If I'm not wrong this thing is soon to be created for milirary and inteligence using. Machine translansltion between closely related languages (eg French English and German) is possible but only because the underlying similarities are sufficient that a computer can make reasonable guesses as to the proper substitutions to make without any real "understanding" of the text. Such programs were first developed from the mid-1970s to the mid-1980s and work in essentially the same fashion now as they did then. Attempting to apply the same technique to highly dissimilar languages such as English and Japanese usually results in a barely intelligible word-salad. Machine translation between unrelated languages is a ferociously difficult problem and is unlikely to be achieved with anything resembling any of the currently employed methods. It may not even be possible with anything short of fully human-equivalent AI. However, single printed words can be translated by Google already, can't they? Of course, grammar and syntax complicate the issue. I'll have some raspberry vinaigrette with that word salad.! There's an old NSA joke about that. Back in the early 1970s, the leaders of the USA and USSR decided it would be useful to have an instantaneous communications link for use in avoiding accidental nuclear war. NSA was of course the agency brought in to develop the translation software. Their best linguists and engineers toiled away for months and finally came up with online English/Russian translation. The equipment was installed at both ends of the circuit: printing teletype terminals connected to the translation system. And finally came the unveiling of the system, with Generals and other high officials of each country at their respective terminals. "The ghost is ready but the meat is raw." when it is run through the miraculous machine translation systems of the year 2007. Good morning it is. Jones it is vigorous? Good morning. Is it Mr./Ms. ジョーンズ vigor? Good morning. Is it Jones Mr. energy?